I'm gradually adding work to this page. My black and white Holga film photography will be added soon. Thanks for looking. Exhibited at "Arrow Points to My Room," Jan.-Mar. 2017, Still River Editions, Danbury, CT. Exhibited in "Arrow Points to My Room," Jan.-Mar. 2017, Still River Editions, Danbury, CT; "Meeting Past" Sept.-Oct. 2016 curated by Bibiana Huang Matheis at the Akin Free Library in Pawling, NY; "Conversations in Blue" April 2016, curated by Violet Harlow, Lotta Studio, New Haven. Exhibited in "Arrow Points to My Room," Jan.-Mar. 2017, Still River Editions, Danbury, CT;"Meeting Past" 2015 curated by Bibiana Huang Matheis at the Akin Free Library in Pawling, NY. Approx. 2 1/2" x 3 1/2"
Exhibited in "Meeting Past" 2016 curated by Bibiana Huang Matheis at the Akin Free Library in Pawling, NY; "Conversations in Blue" April 2016, curated by Violet Harlow, Lotta Studio, New Haven. Exhibited in "100!" 2017 curated by Bibiana Huang Matheis at the Howland Cultural Center, Beacon, NY. Sold. 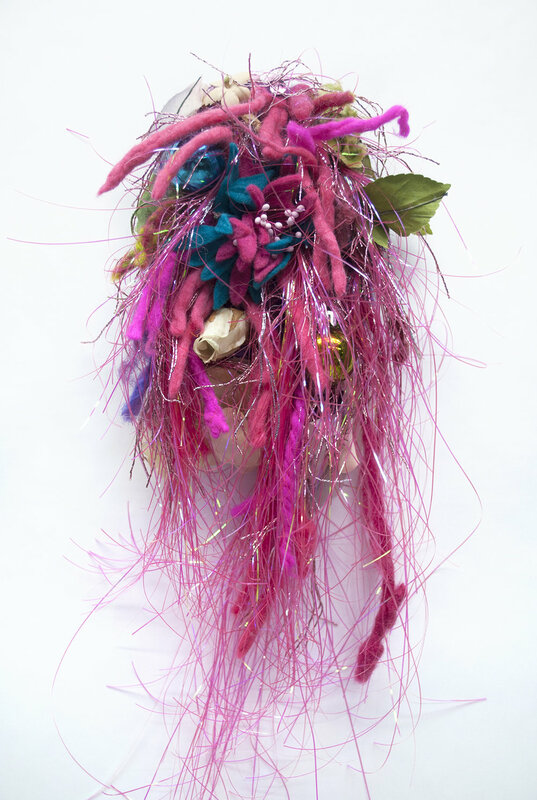 "MERKIN #1 (SORRY NOT SORRY)"
Mixed-media assemblage with crocheted hand-spun yarn, felt, millinery flowers, Easter grass, metallic cord, ornaments on a plaster armature. 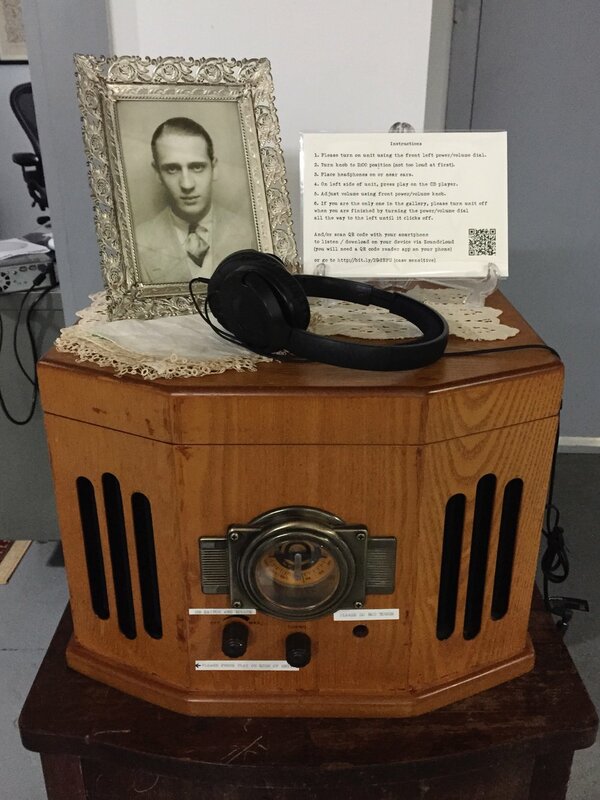 Exhibited in Nasty Women New Haven, March 2017 at the Institute Library, New Haven, CT.
Sound installation containing an original song performed and recorded by the artist as part of "Missing Links" exhibition, curated by Catherine Vanaria and based on a found photo album. Institute Library, Oct.-Nov. 2014, New Haven, CT. 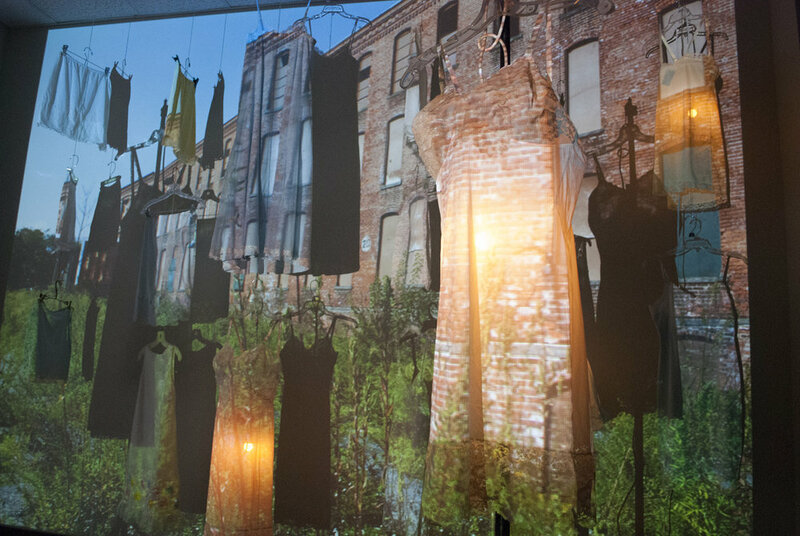 Listen to "Turn the Page"
Exhibited in LAMP New Haven, October 2012; Bridgeport Art Trail, November 2012. Mixed-media assemblage, 38C strapless bra, vintage millinery flowers, pink velvet, ribbon, vintage hat box. Inspired by the Danbury Museum's hat collection, this bra featured 1940s and 50s vintage millinery embellishments on the front, and pink velvet on the inside. It was modeled on the runway and auctioned live to benefit the Smilow Cancer Center at Yale New Haven Hospital. Sound installation in 1950s telephone, CD player, fabricated steel enclosure. Original song "Break up the Family" performed and recorded by the artist. Exhibited in "Prosopography" group exhibition curated by Anne Thompson, Artspace, Hartford, CT, May 2006.